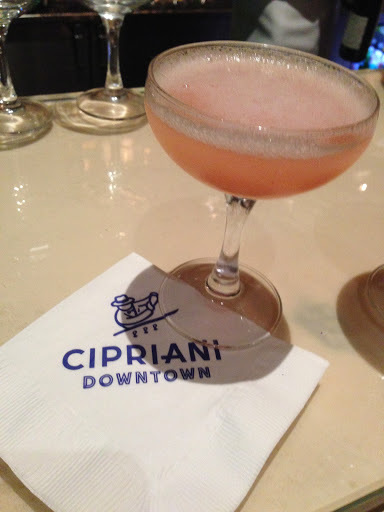 The famed Cipriani group has made its mark in Miami. This upscale Italian spot is the place to see and be seen. Plenty of good people watching as everyone gets decked out to dine here; think Housewives of Miami style. I wanted to see for myself if the food help up to its trendy, shiny new digs. I definitely recommend trying their Bellini, it’s just one of those things you have to do. They’re famous for it and when I went, they welcomed me with a free Bellini while I waited for my table. It’s made with a puree of white peaches and cipriani prosecco wine. It was a very nice gesture and sure was yummy, but I don’t mind sweet drinks once in a while. Now, let me warn you, on this visit to Cipriani’s we didn’t order the usual Italian dishes. 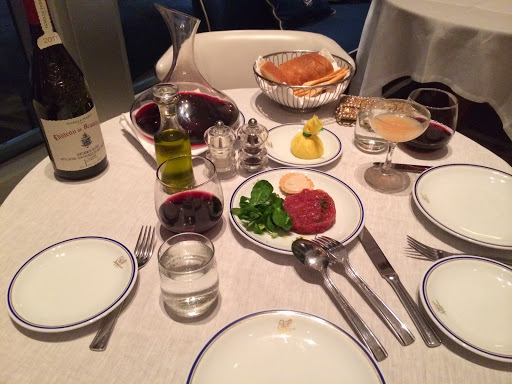 For some reason I was really craving tuna tartare and had to try it there. It was good; nice and fresh and accompanied with some nice greens and a cracker with creamy sauce. It wasn’t the best I’ve had and I was disappointed with the portion as well but keeping in mind it was an appetizer dish. This dish was a special menu item that night and may not always be available. The pork belly was really good! Go figure! Haha. Again, these assortment of dishes aren’t typically Italian so I may have to go back to try their pastas, etc. But, if they have this on the menu when you go it’s definitely a win! 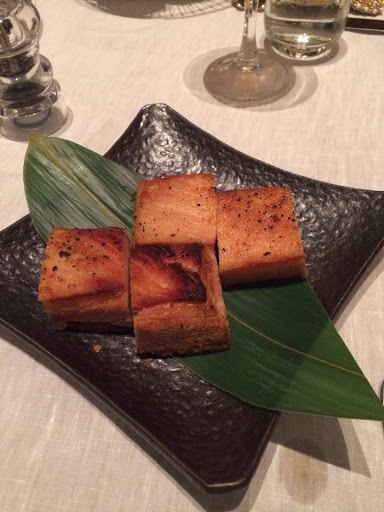 The pork belly was very tender and soft and was accompanied with a sweet dressing on the side. Perfect for dipping! This was another dish that was on their menu that night. 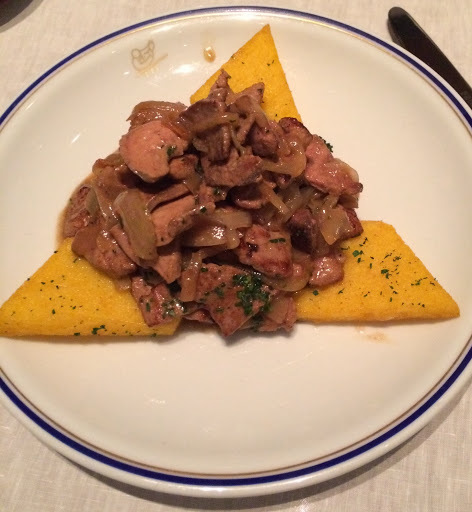 It’s sauteed calf’s liver with polenta. I know it sounds strange but it was actually very good! I would recommend it if you’re looking to eat something different. It was a good portion as well. On another day, I went to Cipriani’s just for dessert and espresso and decided to get Tiramisu. 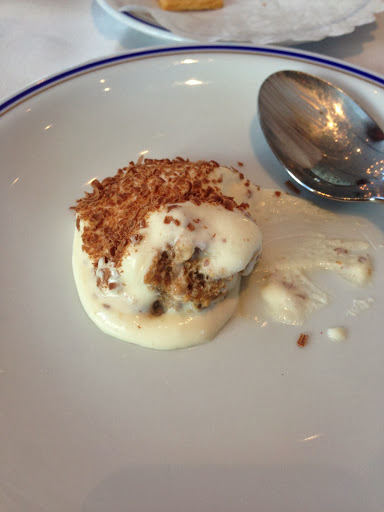 Tiramisu is one of my favorite desserts and when done correctly it’s the perfect end to a great meal or just on its own. 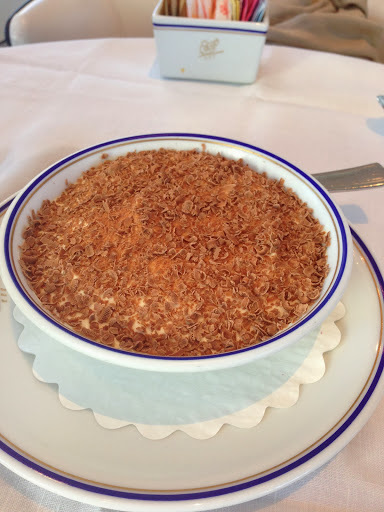 🙂 Before I get to the Tiramisu at Cipriani’s….Tiramisu can be done in many ways varying the amount of mascarpone, coffee, lady fingers, etc. In other words, tiramisu can be done in a variety of ways but always sticking to its main flavor profile. Below are some detailed pictures. All in all, the dinner was nice and will have to go back to try the more traditional Italian dishes. 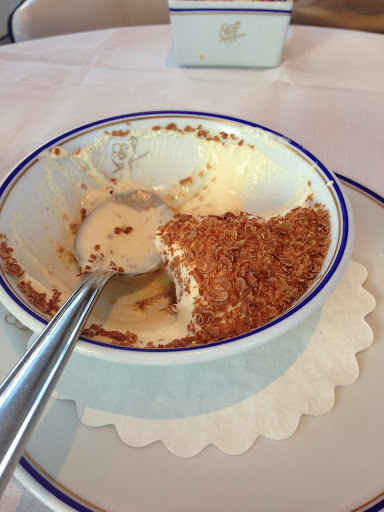 However, the tiramisu was definitely disappointing. In addition, they did not offer us limoncello, a typical Italian after-dinner drink, at the end of our dinner, as is customary in most Italian restaurants. I do recommend going though and trying it for yourselves! And check out the story of their history on their website, it’s pretty interesting.